So maybe you have neglected your lawn for a bit and want to start taking care of it. What are some things you can do to start getting it into shape? Apply a pre-emergent herbicide to prevent weeds from germinating. Think of this as part of your defensive plan for your lawn. Scotts Halts (Amazon & Lowes)and Green Light Amaze (Amazon & Lowes) are good herbicides for the job. I have also found corn gluten meal (Amazon & Lowes) to be a good natural product for the job. Mow your lawn, even if it’s just the weeds growing now and not the grass. Mowing your lawn to a proper height will keep the weeds from getting large enough to seed and will act as another layer of defense for your lawn. Mow frequently enough that only one-third of the grass blade is removed at every mowing. Mow St. Augustine and Bermuda to 3 inches tall, zoysia to 2 inches tall and buffalo grass to 5 inches. Go on the offense by pulling already established weeds or using a post emergent herbicide. The important rule I have found with spraying a post emergent like Spectracide Weed Stop is to make sure to only apply it when it when it will be between 45 degrees and 90 degrees and you have plenty of sun. I have found it to be barely effective of cool overcast days but highly effective on warm sunny days. Make sure to spray it primarily only on weeds and make sure to test on a small portion of your lawn to ensure the brand doesn’t adversely impact your grass. Also be aware post emergent herbicides don’t work on everything so pulling might still be required. 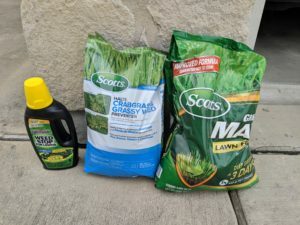 Other steps might include adding in mulch or fertilizers to your lawn but I find the first three steps the most important to start getting a handle on things.